In this article the properties of the GridLineAnnotations are described depending on the type of axis the annotation is associated with - cartesian, polar or radial. Axis (CartesianAxis): the CartesianGridLineAnnotation needs to be associated with horizontal or vertical cartesian axis explicitly. Value (object): the place on the associated axis where a line crosses it. >When the associated axis is numerical (Linear or Logarithmic) a numeric value is expected, and when it is a CategoricalAxis - a category is expected. Label (string): the string that defines the label of the annotation. By default it is null. LabelDefinition (ChartAnnotationLabelDefinition): defines the position of the annotation label. Check the Annotation Labels topic for more details. Value (double): specifies the location on the polar axis (the radius), where the circular grid line crosses it. 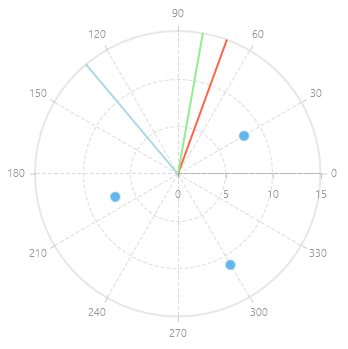 Value (object): specifies the location (angle or category) on the radial axis, where the grid line is drawn. >When the radial axis is NumericalRadialAxis a numeric value is expected, and when it is a CategoricalRadialAxis - a category is expected. 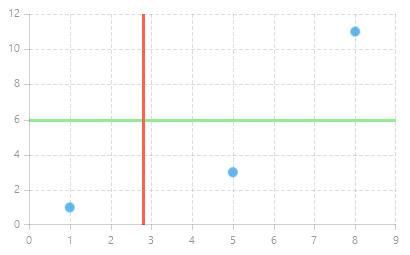 In the case of CartesianChart, the GridLine represents a vertical or horizontal line that crosses the entire plot area. Here is an example that demonstrates how to define both horizontal and vertical CartesianGridLineAnnotation in a RadCartesianChart. 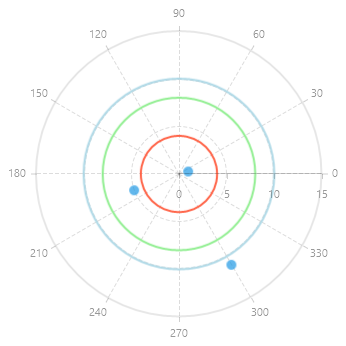 PolarAxisGridLineAnnotation is represented by concentric circles that cross the radial axis at specific Value. This example demonstrates how to define PolarAxisGridLineAnnotation in a RadPolarChart. PolarAxisGridLineAnnotation is represented by lines along the radius of the PolarChart. Here is an example that demonstrates how to define PolarAxisGridLineAnnotation in a RadPolarChatr.